Looking on the bright side I guess its good mental preparation which is going to be a massive part of my round – hopefully I won’t have to cling to any fence posts to prevent myself being blown over or wade through waist deep snow on it. 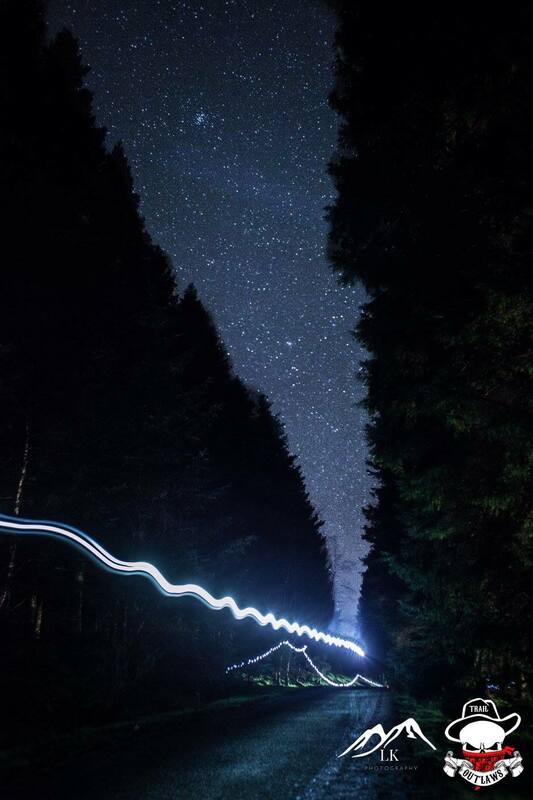 I’ve always fancied doing this event in the 3 years that it’s been running – I’ve done the daytime Kielder Marathon 3 times and always enjoyed the route. This year the event filled up really quickly so I put myself on the waiting list and thought no more about it. Then around 3 weeks before the event I received an invite to enter. I deliberated for quite a while on whether to enter or not. I hadn’t done any of the type of training I would normally do for a marathon (tempo runs, intervals, long runs with sections at marathon pace) and I wasn’t going to get marathon fit in 3 weeks and I didn’t want to sacrifice any training by tapering. I’ve been doing around 40-50 miles a week but a large part of this has been in the fells and at a significantly slower pace than my usual marathon pace and other than that it’s been very easy running. It’s a lovely route though with a good few hills so I thought it would be good training. That’s it then, I’ll do it as a training run. Race day arrived and weather was fantastic – brilliant clear blue sky, warm, sunny and not a breath of wind. I was staying overnight in the scout huts so after I parked the car and registered I made my way over to the dorm. Rob Masson, Kirsty West, Deb Tait and Dominic Martin were also doing the race and I caught up with them for a bit banter beforehand. After registering I had about an hour to go before the start of the race so I took the opportunity of getting a bit rest in my dorm. There’s not many races where you can be lying in bed 5 minutes before a race starts (and lying back in it 5 minutes after it ends)! 5-30 and the race start arrived so we all made our way over to the start line and the race was off. I got a little carried away and immediately found myself in the lead pack running at a pace which felt very comfortable (around 7 minute mileing). After a few miles the pack thinned out the lead pack was down to 3 of us. One of the lads then dropped his water bottle so he stopped to pick it up, leaving just 2 of us. This was now around 6 miles into the race and the pace was still comfortable – we reached the first checkpoint and drinks station and the other lad stopped to take a cup of water. I went past him and took the lead, but seconds later the Marshalls were shouting me back – I had went right instead of left – schoolboy error. I raced back to get back into position and during this spurt I now found myself at the front of the race with a small gap. I didn’t really want to take the lead this early but now that I had it was time to take a chance. I upped the pace and in the next mile I had opened up a gap of around 10 seconds. All sorts of things were going through my head now – could I hold on and win the race? It was too early to tell so I just kept on going and sustain my pace. Then at 14 miles the tiredness started to kick in. I took a gel but my body didn’t like it and responded with some nasty stomach cramps. The balls of my feet were really sore too having been hurting since around mile 3 – an ongoing problem I still have. I sensed that I was slowing and was caught by 2nd place. I knew by the way I was feeling that I wouldn’t be able to catch him so resigned myself that I wasn’t going to win the race. Could I hold on for 2nd though? By the time I had reached the Dam at mile 16 things had deteriorated. My feet were screaming now, the stomach cramps were becoming more frequent, my legs were sore and my energy levels were shot. It was now dark and looking back I could see 2 headtorches behind me – 3rd and 4th place around a minute behind. My frame of mind had now totally shifted. I still had around 8 miles to go and I felt terrible. I’ve been in this position before in a number of marathons and there is absolutely no worse feeling in the world. Pushing through those final miles when your whole body is screaming at you to stop is a world of pain I really didn’t want to be in considering this was just supposed to be a training run. I had a big decision to make – so what were my options? I could push on and try to defend my position – I’ve done this before in the past but I was worried about how much it would take out of me and how long it would take to recover. I also didn’t feel confident that I would be able to hang on to 2nd place. I had to think of the big picture and my BGR training – I had planned to go to the Lakes on both Wednesday and Friday and I didn’t want to compromise this. If the race had been an A goal for me then it would have been a different story but it wasn’t and I needed to be sensible. Next option – retire. But where and how? I didn’t know how far to the next checkpoint was but I suspected it was at Leaplish which is only a few miles from the finish. There’s no way I was going to run 24.5 miles and then retire. Next option – reduce my pace, forget about times and positions and just finish the race. This seemed like a better option and I slowed down. Although this helped a bit I was still getting bad stomach cramps and it was still a massive effort to keep moving. At this point 3rd and 4th place passed me, asking how far ahead the leader was. I had no idea but it must have been quite a way by now – bar a disaster on par to mine they weren’t going to catch him. Another option then presented itself – if I’m not concerned about times or positions then why not stop running and walk it in. Yeah, that option seemed very appealing so I finally gave up any semblance of running and began the long death march back to Hawkhirst. Although this seemed an easy option it was far from it – it took about 2 hours to walk those last miles and I started to get very cold because of the drop in pace. It was also still quite an effort to keep moving and the pain in my feet wasn’t getting any better. I did stop a few times, switched off my headtorch and looked around to take in the fantastic views of the stars in the night sky and streams of headtorches alongside the lake. When I did finally get to the end there was a good throng of people in the finish hall (yes you finish inside a hall!) and I had a hot cup of tea to try and warm up (something I didn’t achieve until the next day). I would have liked to stay up and party but I was so exhausted and cold I just couldn’t face it so I retired to my bed. So quite a frustrating experience for me and a bit of a wake up call. When you are running well it’s easy to think that you are invincible and you can take on anything. This clearly isn’t the case and the next injury is just round the corner – I need to keep reminding myself this and keep myself right in the next 11 weeks. I know one thing for certain though – I’ll be back next year but this time I’ll train for it properly. Since the race I’ve managed to get over to the Lakes and do Leg 1 on both Wednesday and Friday evening. I felt tired on Wednesday, but then a lot better on Friday so I’m confident I made the right decision. I’ll write about these and the other training I’ve done in my next post. This entry was posted in Fell Running, News, Race Reports, Results, Rob by Rob Brooks. Bookmark the permalink.